Pope Francis is generally popular around the world, but when he highlights the global effects of climate change Friday at the United Nations General Assembly, he may get a lukewarm reception from many Americans and Europeans. Global climate change was the top-rated threat in a 40-nation Pew Research Center survey conducted in spring 2015 – a median of 46% say they are “very concerned” about climate change. 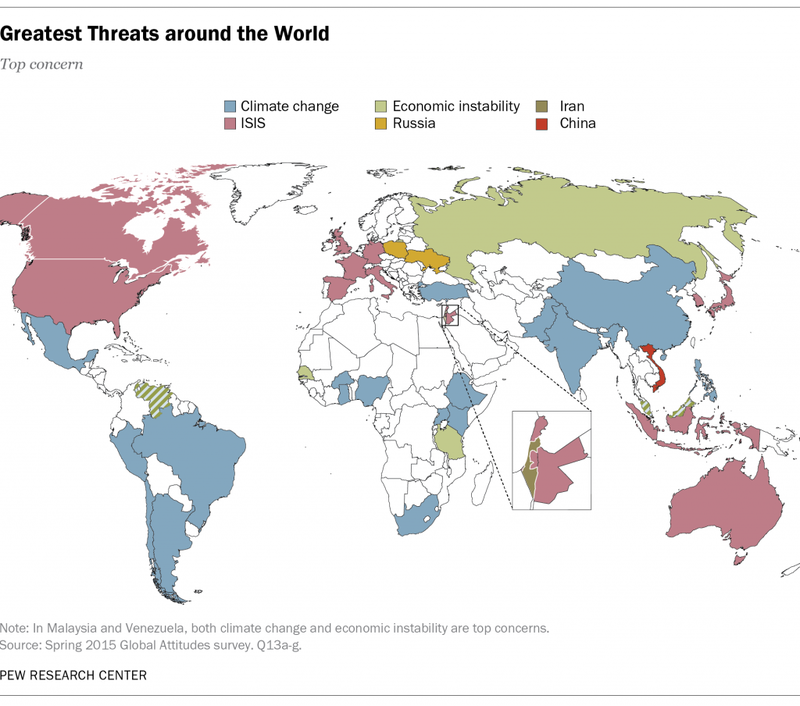 But concern about climate change is relatively low in the United States and Europe. A median of 42% among both Europeans and Americans reports being very concerned about the issue. And in the U.S., partisan differences are stark. A majority of Democrats (62%) say they are very concerned about climate change, compared with just 20% of Republicans. For the most part, European and American concerns about international issues lay elsewhere. In Europe, concerns about the Islamic State (ISIS) and tensions between Russia and its neighbors are more prominent than other issues. Among Americans, ISIS and Iran’s nuclear program loom large as threats, while climate change ranks substantially lower than in other regions. The only global issue that raises fewer concerns in the U.S. is territorial disputes between China and its neighbors. This stands in contrast with Latin America and Africa, where about six-in-ten people (a median of 61% and 59%, respectively) express serious concerns about the threat posed by global climate change. It ranks as the greatest threat in nearly every country in these two regions. Asians are also relatively concerned about climate change. With a median of 41% voicing serious concern, the issue captures the top spot in half of the Asia-Pacific countries surveyed. 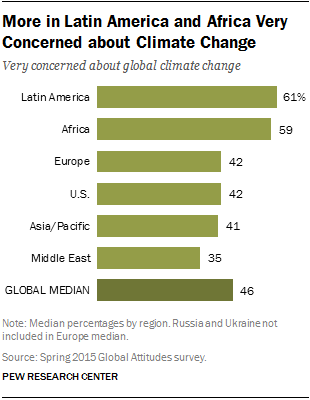 Middle Easterners are the least likely to say they are very concerned about global climate change. A median of roughly a third (35%) says it is a serious concern, though the Turkish public cites climate change as their top concern.